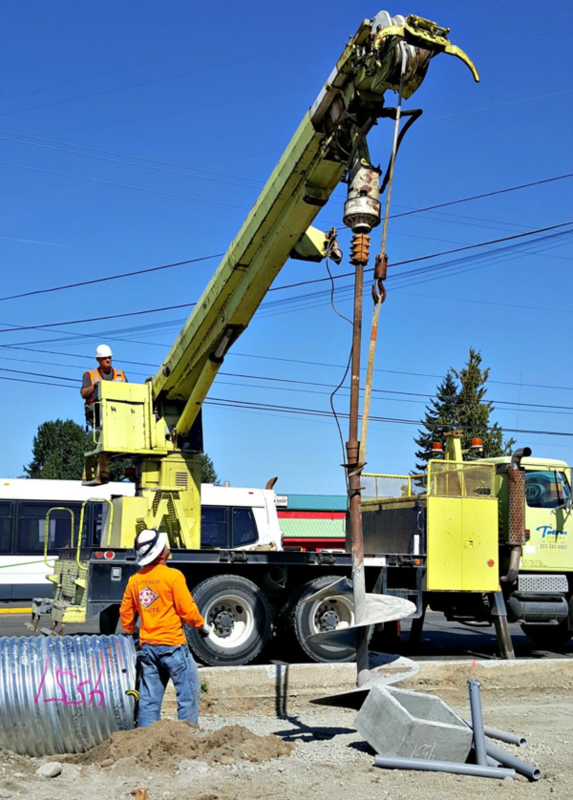 Above: Construction crews use an 11-foot long “drill bit” to bore a hole for the future electronic street sign that will indicate the new right turn lane onto southbound I-5. Work continues on the 128th Street widening project for the Swift Green Line. New right lanes are being created on each side of I-5 in south Everett. This summer, crews are working on the west side of the freeway. Eastbound traffic on 128th Street near I-5 continues to be impacted weekdays between 9 a.m.-3:30 p.m. as underground utility work is taking place. Cement for the sound barrier wall near Denny’s restaurant will be poured on two separate days next week. This will impact traffic near the southbound onramp to I-5. On Wednesday, Sept. 20, the PUD is expected to do some night work in this area after the evening rush hour. A potential weekend closure of the two right lanes approaching I-5 may take place on Sept. 30-Oct. 1 to pave the new right-turn lane. 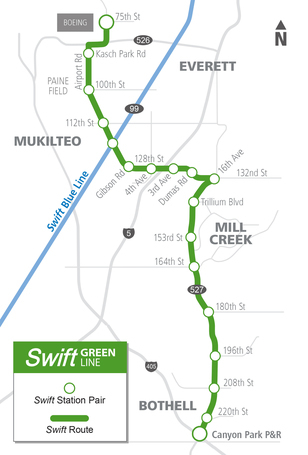 The Swift Green Line is scheduled to open in 2019. Daytime traffic impacts along 75th Street will continue for the next month as trenching and utility work continues on the Seaway Transit Center at 75th & Seaway Blvd. near Boeing. Onsite, the large mound of dirt will be used to backfill the storm water retention vault. After that, underground utility placement will occur, then the ground should be graded to prepare for surface development. In late September or early October, work along Seaway Blvd. is likely to impact traffic on that busy road. Dates and details are yet to come. Community Transit’s Route 105 will begin serving this area on Sept. 25. Riders can catch this bus at the Everett Transit stops on 75th Street near 16th Avenue west of the PUD substation. Schedule and route map information is available online at www.communitytransit.org/schedules. Bus stops closer to Seaway Blvd. are expected to reopen in late November.